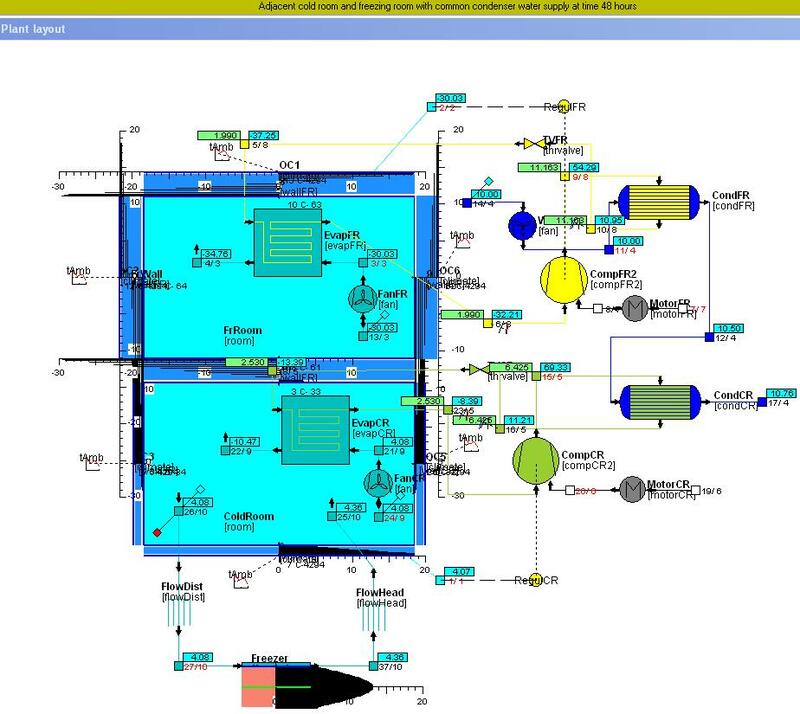 FrigoSim is a process simulation program for thermal energy plants . It is particularly suitable for design of refrigerating plants, including heat pumps and air-conditioning systems. FrigoSim assists the user in making an optimal design of a plant with respect to capacity and economy. The accuracy of the calculation is mainly based on the component data quality and the user effort to set up a detailed plant description . Fluid thermal and transport properties data based on built-in function libraries for 35 refrigerants and 13 pure fluids and 12 aqueous fluids over a range of concentrations . 95 component models using these fluid libraries. Arbitrary complexity in connecting a maximum of 1000 components. Duplication of entire plants or plant details for set-up of multiple aggregates. Any number of concurrent multiple-layered, transient heat conduction calculations with non-linear/phase-change materials, connected directly or through other components. Working directly with plant layout, with component symbols selected to your preference. Calculation results also presented in layout. Alternative display of results in enthalpy-pressure, entropy-temperature and psychrometric charts. Construction of plants from scratch or from a number of plant templates. Support for user or company specific component libraries. Scaling of single components, groups of components or entire plants to meet capacity requirements. Component optimisation mechanism for best plant performance. Nine versatile control mechanisms applied to single components or component aggregates. Output of user-selected component quantities . Calculation of user-specified quantities , e.g. for economy analysis. Output for spreadsheet processing. Flexible description of component properties . Mechanism for input of practically available data , including data from industry. On-screen tools for instant check of effect caused by component size change, fluid property changes, or modified boundary conditions or control-type conditions. The unit system can be selected from several alternatives (SI, UK and US) plus individual unit selections. Windows user interface, with logically organised menu commands , toolbar and HTML based help texts. Start by reading the brief introduction and the practical hints . The latest information on the program development is found in the development history , particularly most recent changes . If you need more information, please make a request to Thorbergsen Frigosoft .